I’m not sure because I never tested it with those value officers. No bug here. 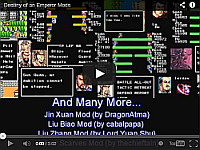 The problem with the DP is specific to the Cao Cao mod. Looks like James put in values for DP that are not in the dptable.tbl. Solution is to either change all officers that are “unknown” to some value in the table, save it, close the ROM, and re-open it or change dptable.tbl. I’d recommend just changing the officers that have unknown values. The DP table is not pulled from the ROM, its static and only references what the default game values are. The actual DP values have been changed in the ROM, this is what I wanted to change but like I said, the DP table is all over the place it seems and the values that James made them are pretty insane. This means it’s only adding values to the list that match between the table and the ROM. Anything else it will say “Unknown”. Also I tested the unbillitable thing with Chen Deng and Mi Zhe. Seems it is reading the last hex value for both of those as well. Should be easily fixable. Probably Base AC raising it? Does Base AC affect enemy officers? Since they don’t have a level to draw from how can it? Mine is just an image with a link to youtube. Don’t think DoaEditor is using this. EDIT: However, I’m not sure how this ties into your DP value of 60 in your example… Will trace it. I’ve got it, I’ll make DoaEditor play nice with the lud’s DP thing. Once you do this, you’ll need to fix your DP values in DoaEditor. Especially the ones that say “Unk”. For the rest of them, that’s what step 1 was for to have it for reference.